Cutting a cigar can come across as a surprisingly complicated procedure for the uninitiated. However, after selecting the right cutter and learning how to properly cut a cigar, it’ll no longer become a daunting experience. Furthermore, there are different types of cigar shapes and sizes as well as cutting devices. It can quickly become confusing how and where you should correctly cut your cigar. 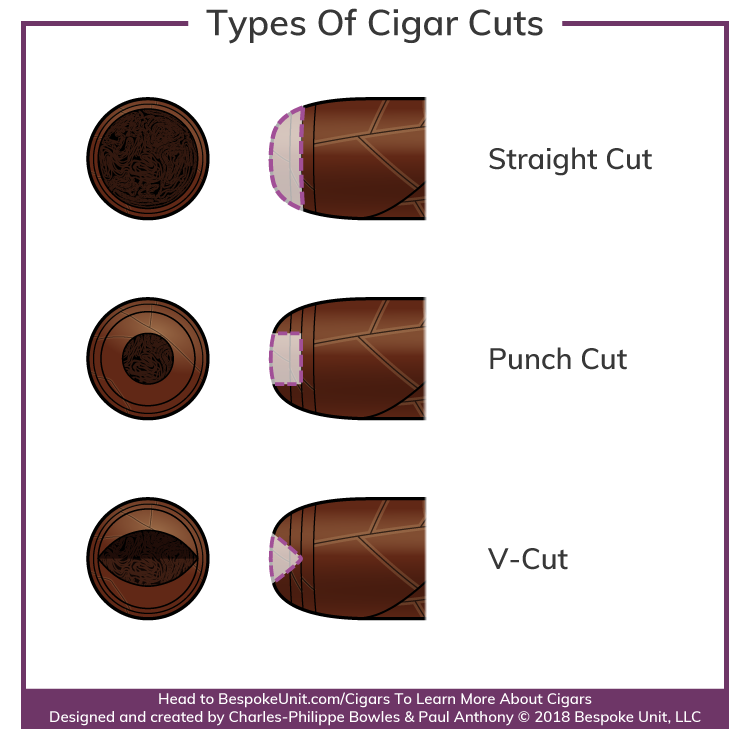 Fortunately, this comprehensive page lists out each of the different methods in an easy guide to the art of cigar cutting. Read on to learn about cutting a cigar before you light it. 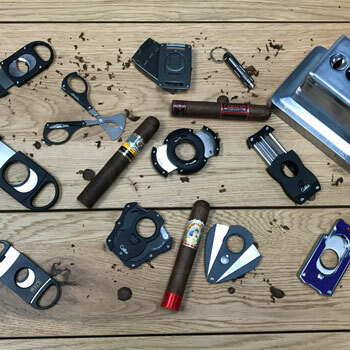 See The Best Cigar Cutters To Buy! Mistakes happen to everyone including the experts. Yet, there’s nothing more infuriating than cutting a cigar for it to unravel before your very eyes. 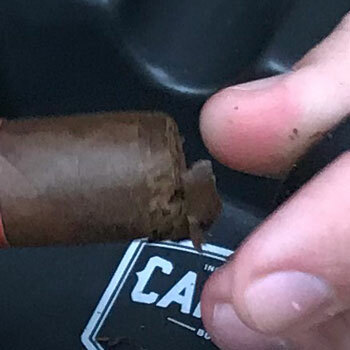 This mishap can happen to almost anyone due to inadvertently cutting your cigar too high. Another crushing experience is cutting your cigar in a way that makes it draw too easily. When cutting too high, it risks opening the head too wide and your cigar will burn too hot and too fast. We’ve all been there but fortunately this guide will make it a much rarer occurrence for you. By reading up on the various ways to cut a cigar, you’ll find the technique that best suits your needs and learn how to master it in minutes. If you just want to read up on a specific section, click on its link above to jump straight there. Otherwise, keep on scrolling! Cutting Made Easy. Follow our guide to learn how to correctly cut your cigar! How To Cut A Cigar Reviewed by Charles-Philippe Bowles on January 8th . 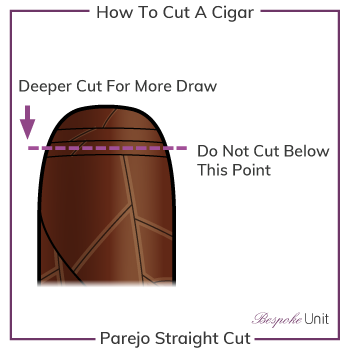 Otherwise, scroll on to learn more about cigar cutting in detail with our helpful infographics. 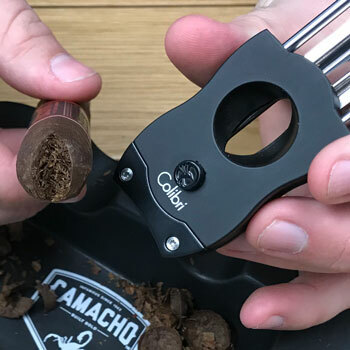 I’ve you’ve read our introduction to cutting, you’ll know that there are a number of different ways that you can cut a cigar. Each one has particular characteristics best suited to different types of cigars as well as their own drawbacks. A dull blade can harm a cigar and end up ruining your overall experience by crushing or tearing the tobacco. Whatever tool you choose, the blade needs to be sharp to cleanly cut through the leaves. If you want to learn about each of the particular characteristics, simply click on it above to read more. Remember that if you haven’t got a good cutter yet, you can refer to our guide to the best cutters to buy online! If you look closely at the cigar’s head, you should see one or several small seams along its circumference. These tend to sit along the curved part of the cigar’s head known as the shoulder and cover the end. This is called the cap and the objective when cutting a cigar is to cleanly remove it while leaving a strip of flag leaf. When making cigars, the roller’s finishing touch is to add the cap using a small swatch of wrapper leaf. This is added not only to give the cigar a completed look but to hold the wrapper together during transit and storage. You should always aim to leave some of the flag and glue when you cut so the wrapper doesn’t become unraveled. This is achieved by cutting below the cap’s end, which leaves a small strip of leaf around the opening. For this reason, Cuban triple caps are one of the most desirable types used on premium cigars. Instead of using a single swatch, the roller applies three pieces of wrapper. The result is a stronger cap that is easier to cut and supports the wrapper in a way that is far less likely to unravel. As cutting in the right spot can be quite challenging for some, it’s no surprise that punch cutters have grown in popularity. As the wrapper leaf is particularly delicate, it can easily get torn when cutting. Therefore, slightly dampening the head before you cut can be a worthwhile precaution. To do this, simply place the cigar’s head on your lips. There’s no need to moisten the cigar by licking it as the humidity in your mouth is perfectly sufficient. 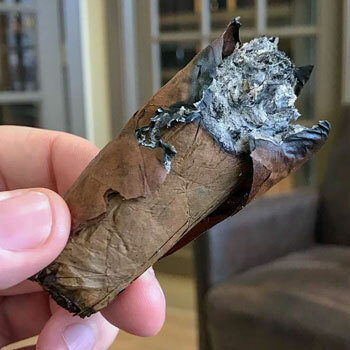 Furthermore, you’ll be able to get an initial taste of the cigar’s wrapper before you light, which is often very pleasant. Cutting a moistened cap is far easier than trying to slice it dry. Even if the cigar has been stored in perfectly humid conditions, wetting the end facilitates your task and reduces the risks of tearing. Straight cuts are one of the most common and versatile techniques available that can be achieved with guillotines, scissors or even sharp blades. Unlike punch and v-cutters, straight cuts can be used for preparing both a rounded parejo or pointed figurado heads. In either case, the cutting action itself should be quick and decisive whilst still taking care to be precise. A slow and hesitant cut can do more harm than good as prolonged pressure can end up crushing the contents or tearing the wrapper. As with lighting, you’ll find it easier to keep the cigar stationary and move the cutter towards it. This will offer you greater control than feeding the cigar into guillotine’s hole. Similarly, holding the cigar nearer the head will provide a firmer grip. 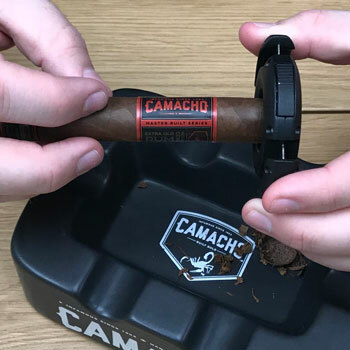 Like when sawing wood, the further away you brace the cigar from the cutting area, the more it will vibrate and risk a rougher cut. If you’re using a single blade guillotine, rest the cigar against the flat side of the hole. This will brace it in place to prevent crushing or slipping. Keep in mind that you have the option to choose how far down you cut between the tip and the flag leaf. The closer you cut near the widest point, the larger your draw will be. Generally, you cut about 1/16th of an inch (2 mm) down the head. However, you can visually inspect the cigar and decide yourself where the best place is to cut with regards to the flag leaf. Hold the cigar close to the head. Place the guillotine or scissors over the cutting area. Slowly close the blade towards the cigar. In a decisive and firm movement, close the blade completely. Lightly brush the cut area to remove any dust. 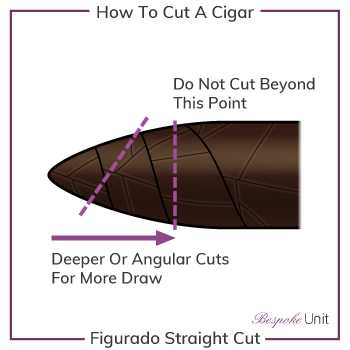 As the points on figurado cigars such as torpedoes may vary, there’s no specific rule of thumb when it comes to the amount that you need to cut off. Generally, the same rules apply when visually inspecting the cigar. Furthermore, the width greatly varies depending on how far down you cut. This offers you the opportunity to choose a draw that best suits your tastes. Similarly, you can cut the cap at an angle to give you a much larger draw if you prefer. Hold the cigar near the head. Select a cutting area closer to the tip than you’d prefer. Slide the guillotine or scissors over the cutting area. Slowly approach the blade to the cigar. In one strong movement, close the blade. Lightly brush the cut area to remove dust. Test the draw by bringing it to your lips. If the draw if too tight, cut slightly higher. An advantage of figurado cigars is that you can cut away in increments until you find the perfect draw. Technically, you’ll have cut enough as long as you see the filler but you can also personalise your experience. However, if you choose to cut diagonally, it may be difficult to cut a second time. If you’re looking for a cut that’s a little different, the cat’s eye might be worth trying out. Mastering it takes slightly longer than guillotines but the pay-off can be an enjoyable smoking experience. As mentioned above, there are two types of v-cutters: guillotine-style plates and long-handled levers. Whilst the former is easier to use, the latter is a more elegant and ornate tool. Lie the guillotine on a hard surface. If using a handled version, hold it firmly in your hand. Bring the cigar towards the opening. Close the blade just enough to see whether the wedge won’t cut the beyond the cap. Firmly close the blade completely to cut into the tobacco. Blow on the opening to remove any traces of dust. Using a V-cut often means that you have to go in deeper than a normal guillotine. Therefore, expect to cut off just over 1/8th of an inch (4 mm). However, take care not to remove too much wrapper and avoid unravelling. It is very important that the blade is sharp and the cutting action is swift. A wedge that’s either too slow or too dull will crush the cigar and tear out a chunk of tobacco. Punch cutters are simple and convenient tool that you can carry at all times on a keychain. While they may not be entirely conventional and frowned upon in formal settings, they’re ideal when out and about. Using a punch cutter is much easier than either a guillotine or v-cut. However, they won’t be able to cut the caps off pointed figurado tips. Hold the cigar firmly near the head. Place the punch cutter over the centre of the cap. Gently twist back and forth while applying light pressure. Once broken through the cap, press again until a few millimetres deep. Gently pull the punch away. Blow on the hole to remove any dust. If the cigar features a particularly wide gauge, you can apply more than one hole until you have the correct draw. The result won’t be particularly slightly but it will be functional. Sometimes you’ll find yourself in a pinch without any tools at your disposal. Of course, you could always smoke the cigar later but you may be in an situation where it can’t wait. If you’re someone who regularly carries a pocket knife, it may seem like the most obvious choice. However, it’s imperative that the knife is sharp and not too thick. A dull blade will be ineffective at cutting a cigar and may cause significant tearing. If the pocketknife is particularly chunky, it might not be fine enough to cut through precisely. Nevertheless, a surgically sharp penknife made from high grade steel should be adequate with a steady hand. Given that razors feature thinner blades with sharper cutting edges, it seems like a logical if inconvenient option for cigars. Having written an entire series dedicated to traditional shaving, we tested a number of razors for cutting cigars. 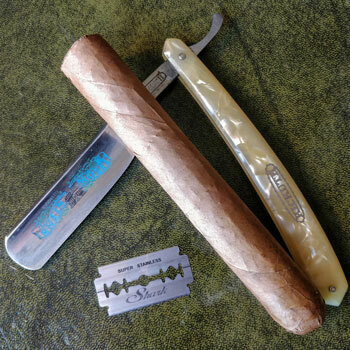 Whilst safety razor blades are thinner, they lack the necessary backbone for cutting a cigar. As most are double-edged, it’s difficult to apply pressure without cutting yourself. However, careful manipulation can create a very clean cut. Meanwhile, straight razors are much easier to control and offer a sharpness unobtainable from pocket knives. Thinner grinds work particularly well and with a slow slicing action, they make short work of a cigar cap. However, although razors are indeed effective, they’re not always a likely solution. Unless you’re a Peaky Blinder, most people don’t carry their razors with them. That said, if you’re at someone’s home and they don’t have a cutter close to hand, maybe they’re a wet shaver and have a razor nearby. 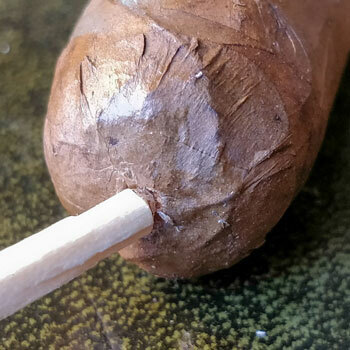 Surprisingly, some people swear by matchsticks as a viable method for punching a cigar. Using the wooden end, you simply twist and drive it into the cigar’s cap to create an opening. The same concept can be used with a nail, screw, pens and fork tips. Anything that’s pointed and sharp could probably be used as a makeshift lance to punch a cigar’s cap. However, we find that the pinhole opening is far too narrow for comfort, which creates a very tight draw. Tar and nicotine can also quickly burn up, which creates a very bitter flavour. Like using a match to hold the cigar in your mouth, we’re not very enthusiastic by this approach. However, if all else fails, you could give it a shot. Often associated with old-country cigar rollers, scraping the cap off with a fingernail can be achieved with a little practice. Using the tips or corners of your nails, you can press one into the cigar cap and rotate. Even if your fingernails are short, it’s still doable. After enough revolutions, you should be able to pull away the cap without damaging the wrapper. You might struggle when you get the to binder underneath the wrapper. However, if you’re careful, you’ll be able to smoke the cigar without the aid of a device. We mention this last mostly by formality. However, we wouldn’t resort to biting a cigar head off even if we were desperate. Firstly, you’ll likely crush rather than cut the cigar. Secondly, you’ll end up filling your mouth with tobacco salad. That said, some enthusiasts will use an incisor much like the fingernail method above. If your teeth are as sharp as Dracula’s you should be able to rotate the head over your tooth like a lathe. After that, you may be able to peel away the cap using your tooth or fingers. Sometimes even experienced veterans encounter issues with their cigars after cutting or during their smoke. For the most part, there isn’t much you can do aside from discarding the cigar or gritting your teeth and bearing with it. The most common complaint when smoking is the outer leaf known as the wrapper coming loose. 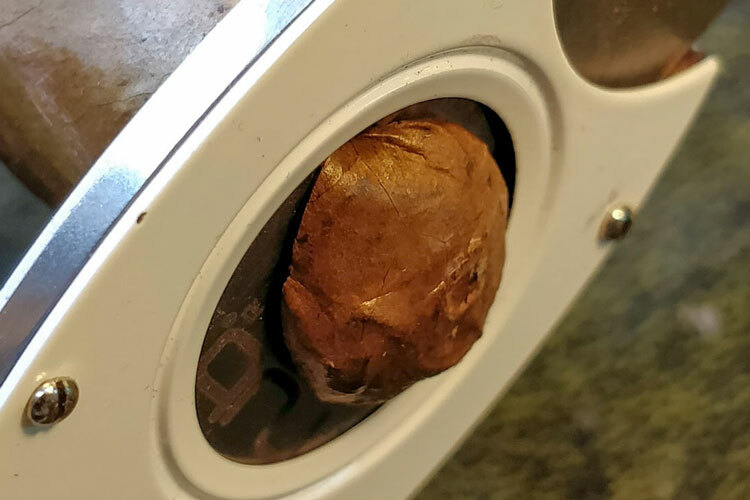 Although this can happen when a cigar is relit as it had the chance to cool down, it’s often caused by cutting off too much. It’s a frustration but nothing to be ashamed of. However, the only real way to deal with it is by trying to bind the wrapper back onto the cigar. For this, you’ll have to find a suitable adhesive. After all, you can’t smoke super glue! The most convenient but least effective material at your disposal is your own saliva. Lick a finger and try to rub the wrapper back onto the cigar. Sometimes this completely works or only provides temporary relief. Otherwise, it may not do anything at all if the unravelling is severe. Alternatively, a natural adhesive such as pectin can be used. Often sold as a powder, it’s a gelling ingredient used for thickening jam and preserves. If you or your wife regularly cook or make jelly, you’ll likely have some floating around in a nearby kitchen cabinet. Mixing a small amount of pectin with a drop of water will create a thick glue. Then, just rub this onto the edges of the wrapper and smooth it down. It’s completely natural, safe to smoke and should provide enough hold to finish your cigar in peace. Sometimes, wrappers can tear after cutting or while your smoke. Sometimes this can happen in extreme temperatures or when the cigar is too moist. 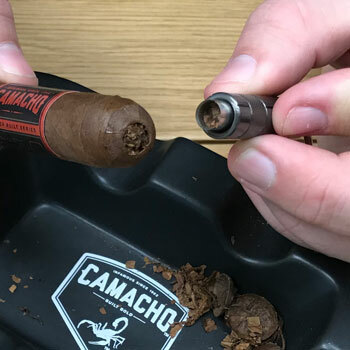 The burning creates steam, which causes the cigar to expand and crack the wrapper. When cutting with a blunt blade, the wrapper may get damaged, which also causes tears. Unfortunately, there’s not much that you can do when this happens aside from toss it or live with it. 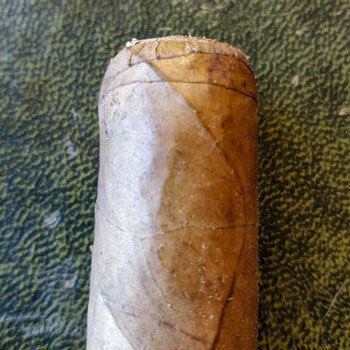 If your cigar band is a little loose, you could always try sliding it over the torn area. This may hold tearing in place long enough for you to smoke it. Storing the cigars in the correct conditions. Moistening the head before cutting. Using a sharp instrument to cut the cigar. Cutting below the flat leaf. If you follow all of the above, you shouldn’t have any more issues. However, if it persists, you may be buying faulty cigars or the retailer isn’t storing them incorrectly. 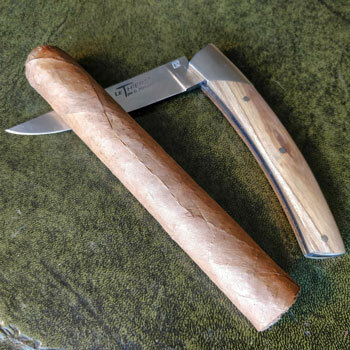 Did you enjoy reading about how to cut a cigar? Consider moving onto the next step and learn how to properly light one too! Alternatively, check out our recommendations of the best cutters to buy online! This is a fantastic and complete guide. Much better than anything else I’ve found elsewhere. I really like the DIY section as I’ve found myself in similar situations more than once! Glad you enjoyed it! Don’t forget that we also have a guide to lighting cigars too! This is really informative, we can definitely add a link on our website to this article. If you would like to review our premium cigar torch lighters, feel free to dm us.